One thing Facebook is good for (other than sucking up your time clicking “ignore” on SuperPokes and Lil’ Green Patch requests) is reconnecting with old high school friends, who can either confirm or deny your vague, “did that really happen” memories. The other day an old friend recalled an epic adventure we had involving The Cure, a bus, and bad Mexican food; weirdly enough, it reminded me of some corny but important life lessons. 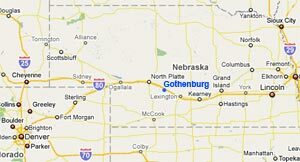 My hometown of Gothenburg, Nebraska is about as far from an urban area as you can get without going on a wilderness trek, midway between Omaha and Denver on an endless, nearly straight stretch of I-80 that anyone who’s driven across country describes with abject horror. This meant that activities city-folk teens took for granted—record stores, concerts, stuff to do that didn’t involve driving up and down main street—were major undertakings for us, and we grabbed opportunities whenever we could. In July, 1987, I was 16 years old and about to enter my senior year of high school. Our marching band (of course I was in marching band!) was set to make a trip to Cheyenne for a parade and judging, and afterward the band bus would take us 90 minutes south to Denver for some touristy activities. 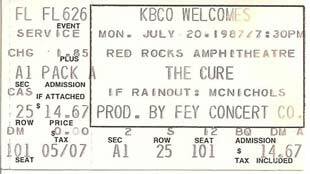 Fun, but imagine my teenage incredulity when I discovered that The Cure would be playing at the legendary Red Rocks venue outside Denver that very night. A fellow Cure-loving buddy and I immediately started planning our getaway. Remember, this is pre-internet, and we sure as hell didn’t have credit cards, so just purchasing tickets required a complicated set of maneuvers involving somebody’s random Denver acquaintances buying tickets and delivering them to us at Casa Bonita, the famous Mexican restaurant where our fellow band-members would be entertained by cliff divers and terrible tacos while we were serenaded by Robert Smith. My memory is a bit fuzzy on the details, but I’m honestly not sure we had actual permission to do this: both my friend and I were first-chair marching band mainstays (myself in percussion, FYI) so perhaps there was a sort of tacit acknowledgment that we could engage in a bit of rule-bending? Either way, we were doing it, and we had to get ourselves to Red Rocks, watch a concert, and then somehow get back and meet the bus at Casa Bonita for the 5 hour return trip to our wee hamlet. No problem. So, uh, “taxi?” Of course, neither of us had ever taken a cab, which was scary enough, and although I’m sure the fare was something like $27, I remember it seeming astronomical, just about the most money either of us had ever spent on anything. Finding our seats, we immediately made friends with the kids around us: a goth girl with tangled hair making multiple miniature Robert Smiths out of blue Play-Doh, an older (like, 19!) guy who gave us sips of vodka he was drinking from a Shasta can. The concert itself I remember as otherworldly, and while I had experienced little live music at the time, it stays with me as one of the greatest shows of my life. 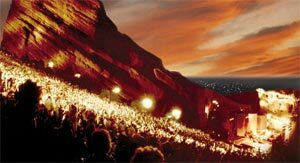 If you’ve never been to Red Rocks, it’s perhaps the most naturally spectacular venue in the world, set up above Denver in the foothills of the Rockies between sheer cliff walls, an endless view of the Colorado prairie laid out before you. This was a stop on the Cure’s Kiss Me Kiss Me Kiss Me tour, and that album’s extended, epic tracks combined with the awe-inspiring setting (and lightning storms off in the distance) to blow my little 16-year-old mind, even though we were so far up in the back benches Robert Smith looked about as big as one of the Play-Doh figures we had gleefully smashed by that point. Afterward, the Play-Doh girl gave us a ride to Casa Bonita in her sputtering little car, and who knows what we would have done otherwise—God bless you, Play-Doh girl, wherever you are! The bus had, of course, been waiting for a significant amount of time (accounts vary as to how much) and anyone left awake was not exactly happy to see us. Later, there were rumblings that we might be expelled from the band or worse, but nothing ever came of it, and in fact, I look back on this as one of my proudest moments. While I was, in many ways, a crazy rebel teenager with goofy haircuts and weird records, in a lot of other ways I was a coward, nervous about rocking the boat or messing up my college-bound path, fascinated but terrified by the world outside our little town. From that perspective, the obstacles between us and The Cure at Red Rocks were major, and the potential for trouble significant. Looking back, of course, all those potential pitfalls have melted away into insignificance, and only the great memory remains. Sure, to many of you (and to you spoiled kids these days!) this may seem silly, but to us small town boys it was a triumph, an unlikely combination of coincidences, lucky breaks, and perhaps even skillful maneuvering and courage. I don’t care how corny it is, it’s a reminder that sometimes it’s best to aim for your goal and barrel through as if you have every right to be doing it, no matter how clueless and scared you really are. 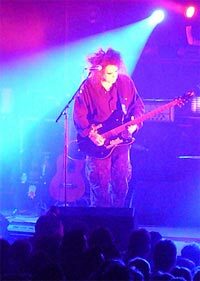 Superficially, it might seem like an ironic lesson to connect with masters of darkness The Cure, but somehow, I think it’s the right one. Robert Smith photo used under a Creative Commons license from Flickr user Jazzisthemusic.